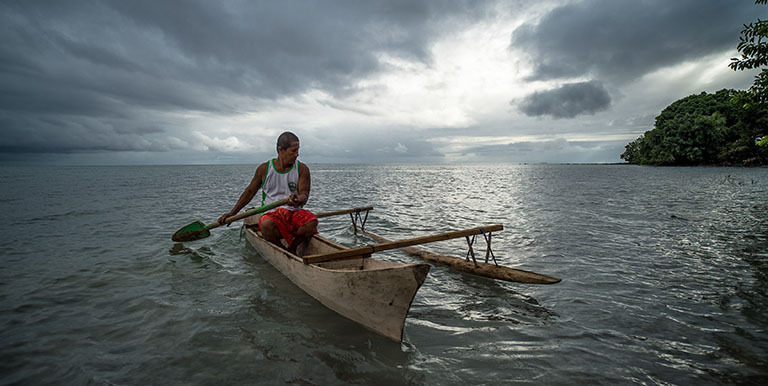 Some climate-vulnerable countries, like those in the Pacific, have entered risk pooling schemes to cover loss and damage from climate change impacts. Photo credit: ADB. Several national and regional initiatives address the risks of loss and damage associated with climate change impacts. To date, there is no formal international funding mechanism for climate-related loss and damage. These are climate change impacts that cannot be prevented by mitigation and adaptation efforts. Therefore, countries need a line of defense both at the national and regional levels to help the most vulnerable populations. Some governments have opted to deploy funds from their national budget, while others have also resorted to more complex financial instruments, such as risk transfer schemes. Regional initiatives in Africa, the Caribbean and the Pacific are based on risk pooling schemes. The Philippine Survival Fund was created through a law enacted in 2012 to finance climate change adaptation projects by local governments and accredited community organizations. However, initiatives that address the risk of loss and damage associated with climate change impacts may also qualify. Eligible projects are land and water resources management, agriculture and fisheries, and health-related projects, among others. In addition, the fund may be used to support early warning systems for climate-related hazards, and help with preventive measures, planning, preparedness and management, including contingency planning for droughts and floods. It can also serve as a guarantee for the risk insurance needs of farmers, agricultural workers, and other stakeholders. The government set aside one billion pesos (nearly $20 million) for the fund from the national budget. However, only local government units in provinces and municipalities with high poverty incidence, high exposure to climate risks, and with biodiversity resources that can potentially be endangered by extreme weather events can access the fund. Moreover, only community organizations with good track record in the area, and that can show expertise in financial management can access the fund. The Fund for Natural Disasters (FONDEN) was created in 1996 to improve the government’s readiness in dealing with disaster losses, including those caused by climate events. It is funded from the national budget. FONDEN can finance emergency response and disaster relief initiatives as well as expenditures to restore infrastructure damaged by disasters. For example, it can finance the reconstruction of public infrastructure and low-income housing, as well as the restoration of natural resources and protected areas, such as forests, rivers, and lagoons. Mexico has other funds as well. A natural disaster fund, dubbed FAPACC, helps farmers rehabilitate their farms after droughts, floods, and heavy rains, among others. The CADENA fund covers crops and livestock destroyed by disasters. Mexico did not just rely on funding from the federal budget. In 2006, it issued the first sovereign catastrophe bond and demonstrated that it was a feasible risk transfer solution. It has since returned to the catastrophe bond market in 2009 and again in 2012. The African Risk Capacity (ARC) project is a pan-African contingency funding mechanism that also functions as a risk pooling facility. It was established in 2012 as a Specialized Agency of the African Union to help member states better plan and prepare for, and respond to extreme weather events and natural disasters through an insurance risk pool that gives access to funds immediately after a disaster. This helps avoid straining national budgets or exhausting aid from donors. Preliminary findings show countries save up to 50% by joining the insurance risk pool instead of opting for individual coverage. The natural diversification of weather risk across Africa reduces risk exposure as droughts or other climate events are not likely to affect all members at the same time. ARC uses a parametric-based insurance system, which means payouts are immediately made when weather thresholds are exceeded, such as insufficient or excessive rains. Each country gets a maximum coverage of $30 million per season for drought that occurs once in 5 years or less. To become a member, countries must have contingency plans that detail how the payouts will be used in the event of a disaster. ARC aims to insure 150 million people in Africa by 2020 with $1.5 billion to $2 billion in coverage across 30 countries. Launched in 2007, the Caribbean Catastrophe Risk Insurance Facility is the world’s first multi-country risk pool providing parametric insurance. The facility was designed to limit the financial impact of natural catastrophes, including extreme weather events. Now, it is formally known as CCRIF SPC after it was restructured into a segregated portfolio company (SPC) in 2014 to pave the way for new products and geographic areas. The payouts can be used to cover the salaries of key emergency personnel; repair critical infrastructure (e.g., roads, bridges); make improvements to critical infrastructure (e.g., drainage); institute mitigation measures (e.g., install meteorological data collection equipment); and provide general budget support, among others. The facility offers members coverage against earthquakes, tropical cyclones, and excessive rainfall. It also uses a parametric insurance system. Triggers can be based on rainfall volume, ground shaking for earthquakes, and wind speed or storm speed for cyclones. CCRIF offers immediate relief to disaster-stricken members. It makes payouts within 14 days after an event. Since 2007, it has made 22 payouts to 10 member states, totaling approximately $69 million. The Pacific Catastrophe Risk Insurance Pilot was launched in 2013 to test risk transfer arrangements for participating countries. The pilot used parametric triggers, such as cyclone intensity or earthquake magnitude to determine payouts. The pilot was part of the Pacific Catastrophe Risk Assessment and Financing Initiative of the World Bank, the Secretariat of the Pacific Community, and the Asian Development Bank, with funding support from Japan, the World Bank’s Global Facility for Disaster Reduction and Recovery, and the European Union. The pilot ended in 2015. The insurance risk pool continues to operate under the recently launched Pacific Resilience Program or PREP. It is a partnership between Marshall Islands, Samoa, Tonga, Vanuatu, the Pacific Community, the Pacific Islands Forum Secretariat, and the World Bank. This article is part of a series of explainers developed based on discussions and contributions at the 2016 Forum of the Standing Committee on Finance of the United Nations Framework Convention on Climate Change, which focused on financial instruments that address the risks of loss and damage associated with the adverse effects of climate change. The forum was held at the Asian Development Bank in Manila on 5–6 September 2016. ARC. 2016. African Risk Capacity Strategic Framework 2016-2020. Johannesburg. ARC. Overview of the African Risk Capacity: Sovereign Disaster Risk Solutions. A Specialized Agency of the African Union. Johannesburg. ARC. How ARC Works. Johannesburg. UNFCCC. 2012. A Literature Review on the Topics in the Context of Thematic Area 2 of the Work Programme on Loss and Damage: A Range of Approaches to Address Loss and Damage Associated with the Adverse Effects of Climate Change. Bonn. UNFCCC. 2016. Information Paper: Best Practices, Challenges and Lessons Learned from Existing Financial Instruments at All Levels that Address the Risk of Loss and Damage Associated with the Adverse Effects of Climate Change. Bonn. UNFCCC. 2015. Report of the Standing Committee on Finance to the Conference of the Parties. Bonn. International Bank for Reconstruction and Development/World Bank. 2012. FONDEN: Mexico’s Natural Disaster Fund – A Review. Washington, D.C.
World Bank. 2015. Pacific Catastrophe Risk Insurance Pilot. Washington, D.C.
World Bank. 2013. FONDEN: Mexico’s National Disaster Fund: An Evolving Inter-institutional Fund for Post-Disaster Expenditures. Washington, D.C.
World Bank. 2016. Implementation Completion and Results Report on a Grant in the Amount of $4 million to the Pacific Island for a Pacific Catastrophe Risk Insurance Pilot Program. Sydney. World Bank. 2016. Press Release: Pacific Resilience Program Launched. Washington, D.C.
World Bank. 2012. Caribbean Catastrophe Risk Insurance Facility (CCRIF): Pooling Risk to Protect Against Natural Disasters. Washington, D.C.
Artemis. 2015. Pacific Catastrophe Risk Insurance Pilot Makes First Payout. Brighton. CCRIF. 2016. Risk Transfer Schemes – the Example of CCRIF SPC: Slide Presentation during the 2016 Forum of the Standing Committee on Financial Instruments That Address the Risks of Loss and Damage. Manila. Xianfu Lu is ADB’s focal point for climate change adaptation. Prior to joining ADB, she worked at UNDP’s Global Environmental Facility Unit and at the Secretariat of the UN Framework Convention on Climate Change. Trained as an applied meteorologist, she spent the first 10 years of her career researching climate scenarios and their use in climate change impacts and vulnerability assessments in different parts of the world. Rexel O. Abrigo supports key adaptation-related activities, including the implementation of ADB’s climate risk management framework. Prior to his current position, he was part of the team that mainstreamed climate change adaptation in the project development process for South Asia, and implemented several capacity building activities there. He has a Master of Science degree on Environmental Science and Management.